THE DROWNING ISLES, THE SOLOMON ISLANDS ARE AN ARCHIPELAGO FILLED WITH IDYLLIC BEACHES AND PERFECT WAVES, BUT AS TEMPERATURES AND SEA LEVELS RISE, MUCH OF THEIR PRISTINE COAST IS DISAPPEARING, Surfer ,AUGUST 17, 2017 BY ASHTYN DOUGLAS “…….A few months prior to our visit, I came in contact with Dr. Simon Albert, a marine scientist at the University of Queensland. 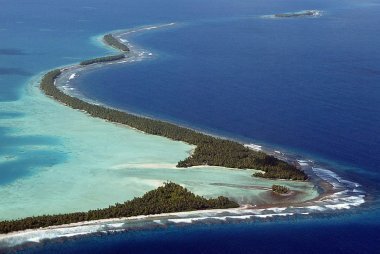 He and his colleagues had recently discovered, using time series and satellite imagery, that five Solomon Islands had been swallowed by the sea over the last 70 years, and another six islands had severely eroded. The cause was determined to be accelerated sea-level rise. “Over the last 20 years, rates of sea-level rise in the Solomon Islands have been three times higher than the global average,” said Albert. “That’s about an 8 or 9 millimeter rise each year.” Half of that number, he explained, is the result of El Niño cycles, which naturally siphon the world’s water into the South Pacific. The other culprit is climate change. In some parts of the country, this rapid sea-level rise, combined with high wave intensity, has eroded beaches and destroyed people’s properties. Even over the short span of five years, many have watched the ocean come into their villages and carry homes away. “The changes have been really swift,” said Albert. “People living on those islands are feeling very physically and psychologically insecure because they’re feeling like their entire foundation of life is washing away.”….